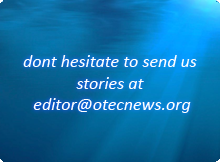 KRISO’s 1MW OTEC plant is the first practical level of plant on a pathway to building a 100MW commercial system. 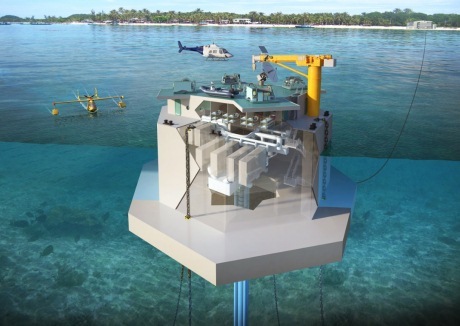 It consists of an octagonal 6,700 tonne four deck floating platform 35 m across moored 6 km offshore in a water depth of 1,300 m. A 1,000 m pipe 1.2 m in diameter will be used to pump cool water up from the depths to be fed to process plant on the platform. 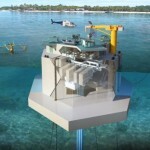 Approval in Principle for Bureau Veritas implies that the design is feasible, achievable, and contains no technological show-stoppers that may prevent the design from being matured and that the design is deemed to be suitable for use in the metocean conditions that the unit facility will be located in. Bureau Veritas’ engineers verified a metocean/hydrodynamics analysis, mooring analysis, stability analysis, and examination of the riser design and system design concept.